November 13, TORONTO – CPAC and CPAC Foundation announced today that they will be holding the 2018 CPAC Annual Gala on December 2nd, 2018 at the Sheraton Parkway North Toronto Hotel & Suites. This fundraising event brings out over 500 distinguished guests that include community leaders, established businesses, politicians, and CPAC supporters every year. The CPAC Annual Gala is a fundraising event co-hosted by CPAC and CPAC Foundation for the charitable work in three key areas: Assisting internationally educated newcomers to Canada with their employment and career development; Promoting education via scholarships and other educational programs/events; Cultivating leadership among immigrant professionals through various programs. 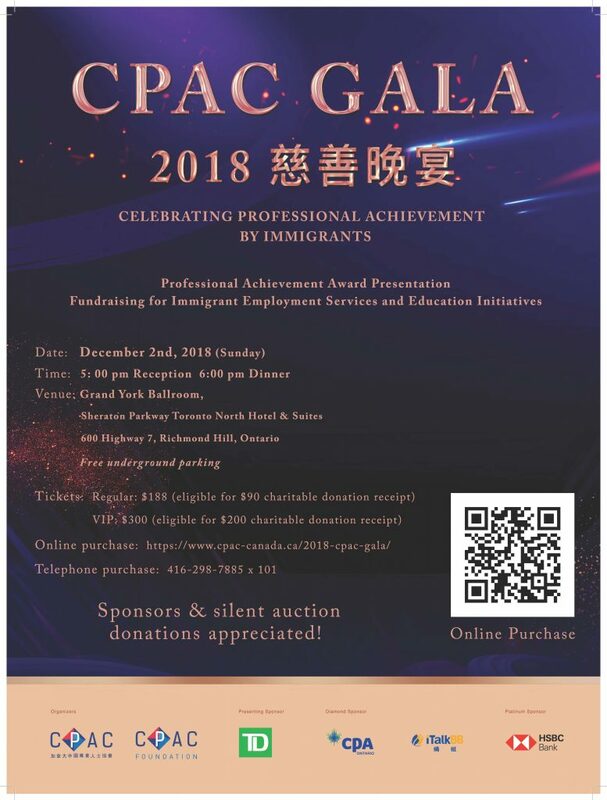 The highlight of the gala will be the presentation of the Professional Achievement Awards, which recognize the accomplishments of outstanding immigrant individuals who have overcome various barriers and made incredible strides in their professional careers, and the Young Achiever’s Award, recognizing an outstanding young person aged 29 or under who has achieved exceptional success in terms of professional and business success, scientific and technological innovation, social entrepreneurship, and/or community leadership. “Supporting the work of helping internationally trained professionals to succeed and helping to develop our youth towards positions of leadership, continues to be paramount in our mission to serve the community. We are therefore very proud to co-host this Gala with CPAC to celebrate these achievements,” said Richard Lim, President of CPAC Foundation. Sponsors, partners and guests will be treated to a lovely evening featuring fine dining, a comedy magic, mind reading & circus stage show, and a silent auction to raise funds for the Foundation. CPAC and CPAC Foundation thank all the donors and sponsors of this fundraising event, particularly Presenting Sponsor TD Insurance Meloche Monnex, Diamond Sponsors CPA Ontario and iTalkBB, and Platinum Sponsor HSBC. CPAC is a non-profit organization serving a community of internationally trained professionals. For over two decades, CPAC has been helping immigrants with employment and career advancement, gaining necessary credentials, and accessing international business opportunities. CPAC is also an organization that assists them with cultural integration into Canadian society. The organization now has over 30,000 members from various cultural and ethnic backgrounds with a wide range of professional training and skills. CPAC members get access to a comprehensive package of services and benefits to enhance their life in Canada. The CPAC Foundation is a registered charity that raises funds in support of CPAC’s work. The CPAC Foundation also has its own education related initiatives and organizes activities that provide educational information to parents and students. It also provides scholarships and awards to secondary and post-secondary students who have demonstrated academic excellence and community leadership. Since 2000, the CPAC Foundation has given out more than 224 scholarships and awards with a total value of $278,000. It has also built two schools in poverty and disaster stricken areas in China.